The recipient of the certificate, Lieutenant William A. "Bill" Clark, Jr., USNR, was Rear Admiral Clark brother. Lieutenant Clark had traveled from the South Pacific to the USS Hornet to supply Task Force 58 with photographic intelligence data for the next operation. Clark later wrote, "I was glad to learn from him that our extensive photography of enemy islands was useful in developing new objectives." Admiral Mitscher received "Share No. 1," and Admiral Clark "Share No. 2." 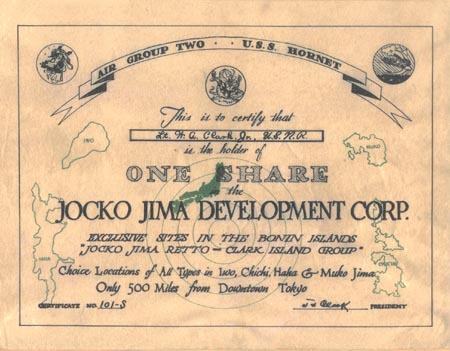 Pilots aboard the USS Hornet claimed responsible for the idea, design and printing of certificates. Certificate of Lieutenant William A. "Bill" Clark, Jr. courtesy of William D. "Bill" Beatty nephew of Admiral Joseph James "Jocko" Clark. © 1999-2006 Utility Press Inc. All rights reserved. Copyright claim exclusive of certificate.